The start of the school year always seems like New Years to me. It is a time of reflection and setting goals and intentions. It is a time for schedules and hoping it all balances with your other responsibilities — work, volunteering, writing your memoir, taking care of your family, starting your new business. So I want to share with you the following article I wrote for a doctor’s newsletter (with some added sassy Deb touches along the way just for you). I’ve been saving it for you all summer because I know you have been off frolicking in Napa, the Cape, Italy or some other fabulous location and the last thing you wanted to do was get back to your “life” and start thinking. So now that the inevitable has happened and we are in the swing of the school year, I present you with the fixings for kicking off the school year and your life in the way that you want to. PS – And just so this doesn’t go to the bottom of your “to do” list, I created a handy dandy worksheet you can print out and fill in for each step. Baboosh! PPS – Share this article and worksheet with your friends, your husband, your co-workers, your hairstylist, your dog groomer. The more the merrier. It’s never a bad thing when we are all creating and living the life we want to live. 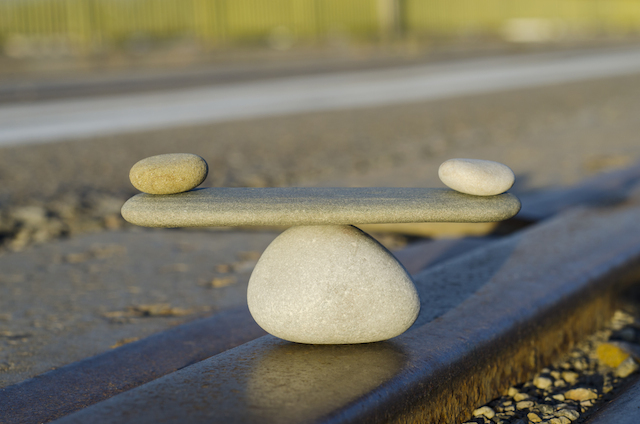 Over the years we have heard about Work-Life Balance ad nauseam, with the goal in mind being “if I could just balance my life, it would be perfect and I would be happy.” After much wrestling and research around the idea of “balance,” researchers and corporate leaders are now declaring this perfect “balance” doesn’t exist and it is illusive. Something we have been fighting and chasing after. Segmentation of the two is more difficult as our work and personal lives are intertwined thanks to technology and personal relationships we cultivate at work. While this may be the case, you can build the life that YOU want and accept. Most likely, it will not be 50/50 any or all of the time, but when you actively create the life you want, you will achieve the balance right for you. Here are 10 steps you can take toward building, sustaining and growing the “balanced” life you want. Proactively decide what you want and what you will accept. Do you want the high paying career and children? What are you willing and not willing to compromise on in either arena? What are deal breakers? Are you willing to commute or do you require your office to be close to home? Do you want to be home and the CEO of your family? For some, working 18 hour days may be a pleasure if they love what they do and the people with whom they work, whereas another individual may find 8 hours stressful if they resent their boss and feel pulled away from family. Women are often hesitant to ask for what we want. We fear we will be thought of as being pushy, uncooperative, self-centered. However, if we don’t ask for what we want, we won’t get it. While at one of my corporate jobs I had a very small window to ask for a raise. I knew that if I didn’t, it would result in a financial loss for years to come and I would be leaving money on the table. I took a leap, knowing the worst thing was a “no.” I asked nicely and presented my substantiation documentation, and I received the raise I had well earned. When we don’t ask for what we want it can lead to resentment and frustration. Ask and know you tried. If the answer is no, you can then make decisions accordingly. Do you hate cooking, doing the laundry, cleaning, going to the grocery store, planning your kid’s party, unloading the dishwasher, creating spreadsheets or presentations? Apply the three B’s – Bag it, Barter it, Better it. Can you not do it (Bag it)? Can you swap duties with someone else (Barter it with a friend or colleague)? Can you Better it by listening to music or partnering with a friend? 4.) Create boundaries. Say no. Ok, you just defined the life you want and now it is your responsibility to maintain it and communicate it to others in the way that you would like to. Our spouses, friends and kids are not mind readers. If we do not communicate the life we want proactively, doctors have found we will communicate these boundaries through less desirable ways such as passivity or manipulation. They also note that people pleasing and silence can eventually backfire, creating resentment. Whether you are at work or home, be present. Often when we are at home we are checking work email, and conversely while at work we are tending to personal calls. When we are present and paying attention to the given situation, we are reaping the rewards of that moment instead of being pulled away. A recent Google study showed 69% of responders do not segment their lives (separate work from home) and found themselves continually checking emails into the evening at home and refreshing their screens to ensure they received any emails. When we are in the moment, wherever we are, we are more mindful. Studies show mindfulness can reduce pregnancy-related stress, improve relationships, and psychological well-being to name a few benefits. Research shows that our thoughts can trigger a physical response and create feelings of stress. This then affects our body and our health. Next time you meet someone new or someone asks you to do something, pay attention to your body and what it is telling you. If you feel free, this Shackles Off feeling is your body telling you it is ok with this situation. If you feel tight, anxious, uncomfortable, your body is feeling Shackles On and there is something about the scenario your body doesn’t like. Take a minute and consider your options. Quickly using the Shackles On or Shackles Off test can point you in the right direction. (Check out my blog from last month for more about how our body talks to us). In today’s overwhelming presence of social media, keeping up with the Jones has reached a new level. There is a larger, more accessible world to compare ourselves and shape our ideal. While social media is a new frontier with limited research, we are seeing more indicators that social media can have a negative affect on self image and self worth. Research has shown that exercise increases your energy level and concentration, and makes you more alert. Increased concentration and alertness result in work productivity. Finding time to exercise can be daunting if you look at the mountain, but when you start with smaller steps you are more likely to succeed and develop a habit. Perhaps start taking the stairs at work or walking a longer way to get to your car, and then each day add a few more steps. I have personally seen progress in clients who have taken this approach (when months prior they would have thought me crazy to add more to their full plate). Not only did the exercising help these clients physically, but mentally as well. Those in the workforce spend at least a third of their life at work. Wouldn’t it be nice to spend 30-40% of your time doing something you enjoy instead of something that causes you stress, anxiety, pain and increased anger and resentment which has been shown to cause heart disease and premature aging? If you are not in a fulfilling career and are searching for your next journey or if you are afraid to or can’t quit your job, take small steps in researching and experiencing different careers. For example, you may be limited on time but can you volunteer for an hour on the weekends or at night at your local medical center or arboretum as you contemplate becoming a nurse or horticulturist? Are you already an expert on your passion? Let your voice be heard and perhaps blogging is in your future. No one and nothing is perfect. Focus on what is right for you, what you like and what makes you happy. Reward yourself and recognize your achievements no matter how small they may be. Next time you get the kids to bed “on time” or make it through your commute when you are 8 months pregnant, make yourself a cup of tea and allow yourself to drink in your accomplishments. When you exercise these tactics, you take charge of your life and are in the driver’s seat. Enjoy the journey. Begin today. Get the worksheet here.